If you’ve ever lived in another country long enough to feel like it’s your home, then you might know that funny feeling when you forget you’re actually living in another country. 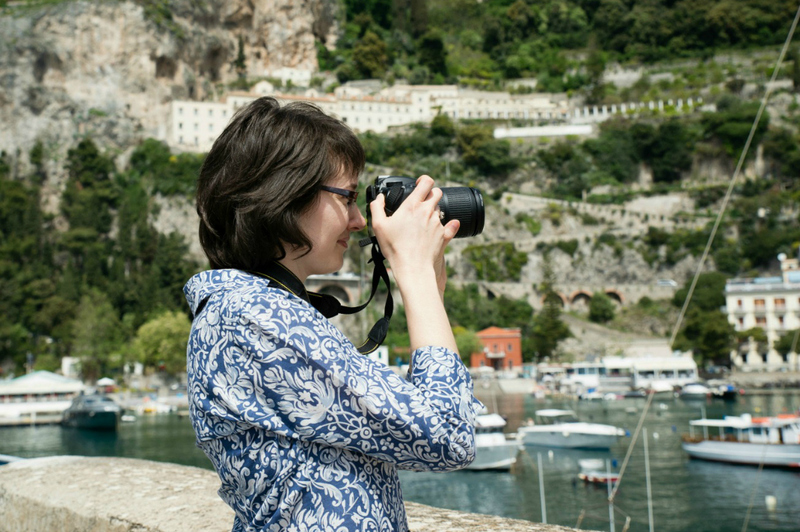 The Amalfi Coast has felt like home since the first time I visited here in 2007. 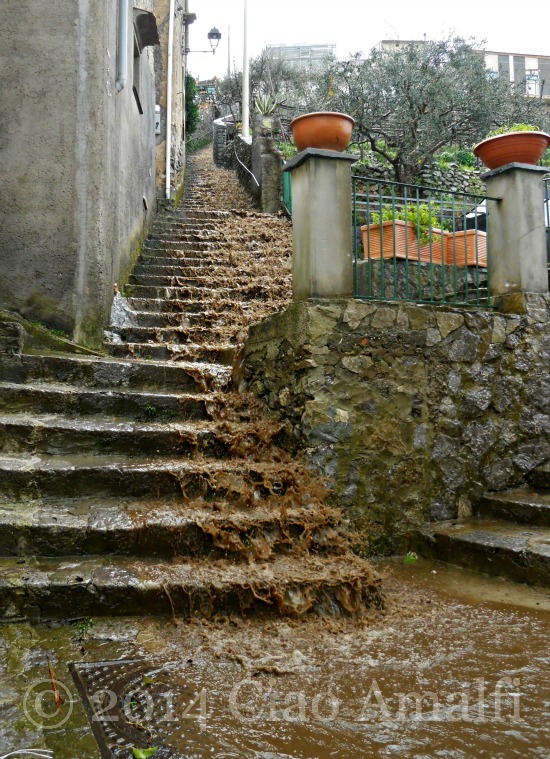 But sometimes there are moments when I experience something or walk around a corner and see a beautiful site that it hits me all over again … I live in Italy! The photo above was one of those moments while out on my regular walk. 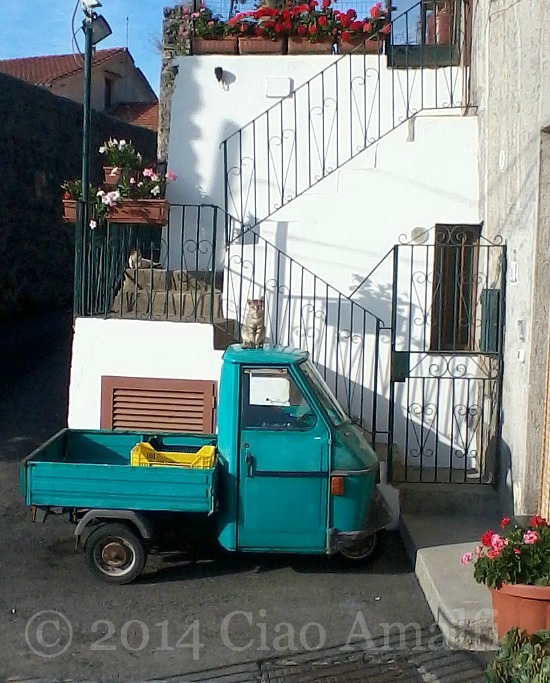 The little three-wheeled truck in bright turquoise, the colorful flowers and the cat sitting right in the middle of it all. I love moments like these! 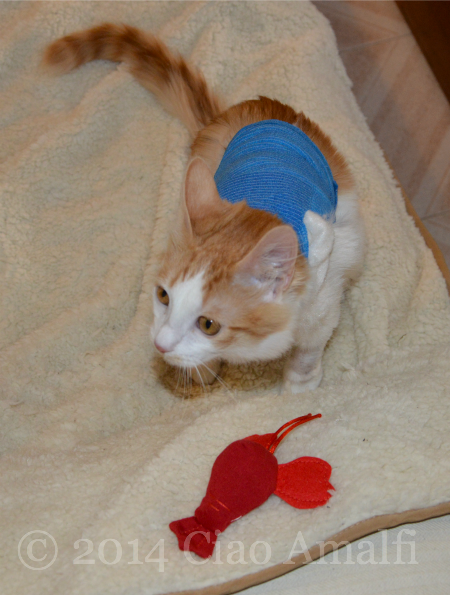 Meet Toulouse … one brave kitten! Today is two months since Toulouse’s big day. Early in the morning on December 17th, we packed up Toulouse and headed off to the veterinario, the vet, for surgery on his right front leg. You might remember the dramatic way little Toulouse came into our family on a Monday at the end of last summer. 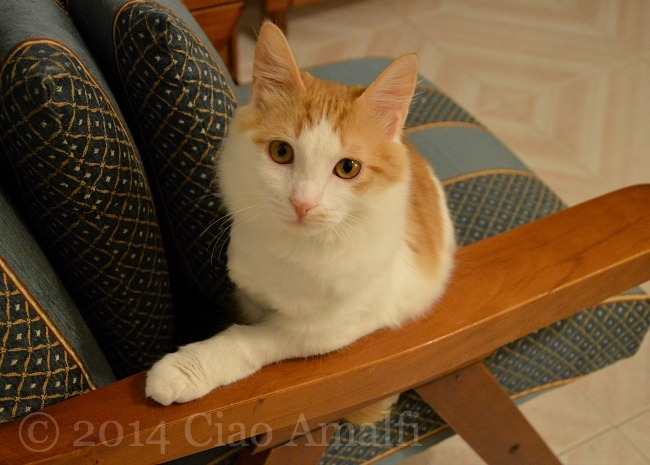 As a tiny kitten he was attacked by a stray cat right in front of our eyes and suffered significant nerve damage. 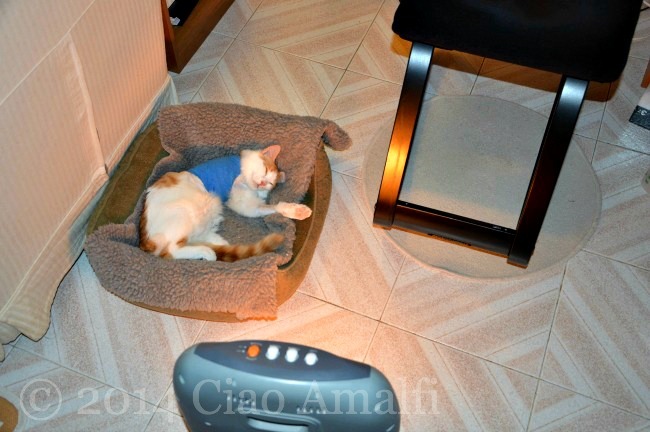 He couldn’t walk at all for about a week, but slowly he regained movement in all of his legs except the right front one. Discussing his situation with an experienced vet and childhood friend of my husband, we we made the difficult decision to amputate the leg that he couldn’t move. We knew it was the best option for Toulouse’s well being, but it was still a hard choice. Eventually it would have developed more complicated issues, and the younger we did it the easier it would be for him to adapt. Turns out that getting used to moving around on three legs was pretty easy! Since he hadn’t had use of that leg since he was about 4 weeks old, he was already a pro at jumping, running and playing. We noticed it was significantly easier for him without the weight of that leg or the claws getting stuck. We stuck pretty close to home for Christmas and New Year’s while Toulouse healed. 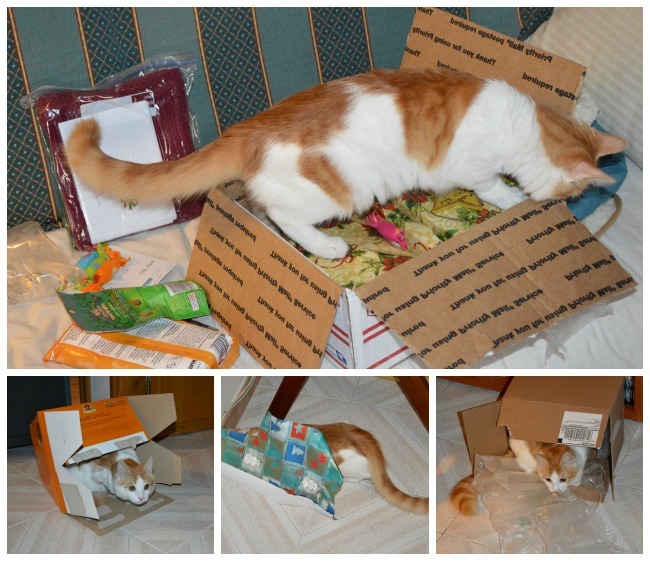 It was a rather slow process since he’s a rambunctious kitten. He pulled some stitches out and had to have 4 more put back in. He didn’t seem to notice much, but it freaked us out. He was far too busy playing and enjoying all the fun things of Christmas. Like wrapping (and unwrapping) presents! Christmas presents come in boxes, panettone comes in boxes … I love boxes! Toulouse is a curious, playful and very sweet little guy, and he has quickly become a part of our family. We couldn’t imagine the house without him! And although he may only have one front leg, he has already figured out how to use it for maximum cuteness. 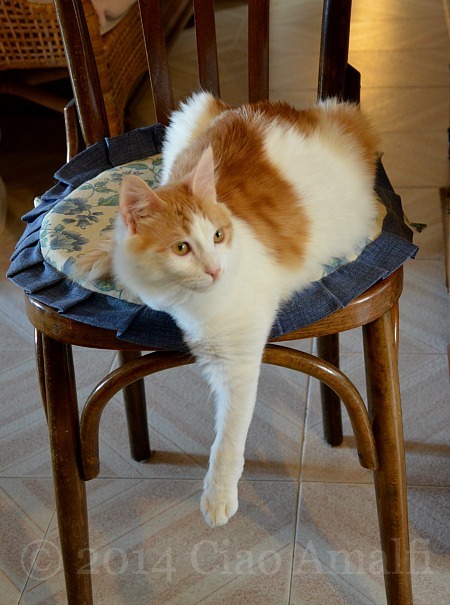 Toulouse had an unlucky start to life, but we’re so grateful to have him in our lives. He needed a family to love him, but I suspect we needed him as much as he needed us! There’s nothing quite like when the sun comes out in February after a rainy spell. There’s the warmth of the sunshine to dry everything out, but also that sense of spring on its way. It’s hopeful, warm and irresistible. And not just for the Amalfitani! 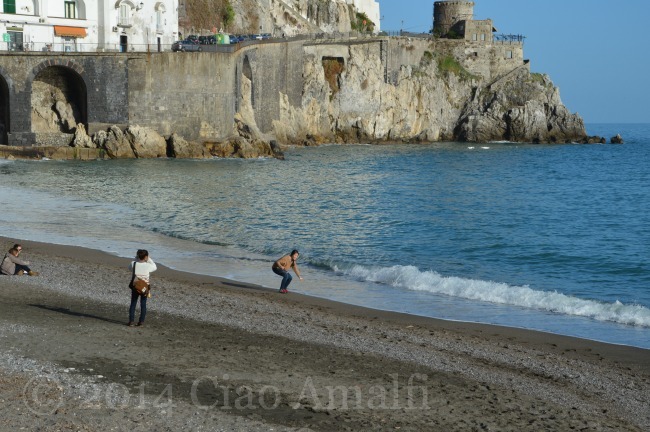 We took an afternoon stroll in Amalfi this afternoon and had fun spotting all the people out enjoying the sunshine – tourists, locals, fishermen and kids playing soccer on the waterfront promenade. 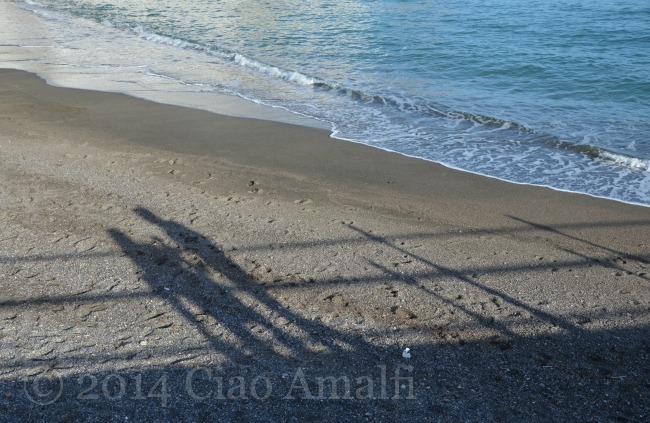 When the sun shines the best way to enjoy it in Amalfi is with a walk overlooking the beach and along the harbor. The water was temptingly blue, but still quite cold. 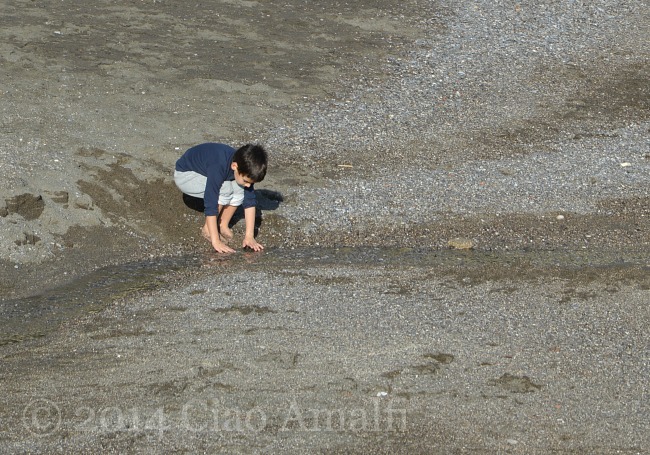 Yet there were people wading along the water’s edge with their winter pants all rolled up. A few people were out on kayaks, too. 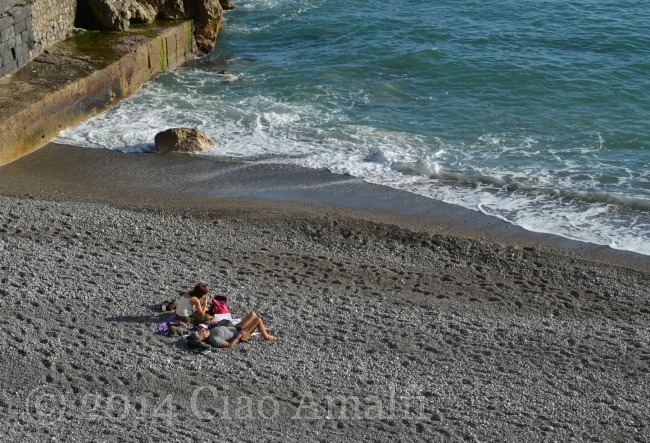 But the really smart people had claimed a spot on the Marina Grande beach and were soaking up the sun. It was strange being dressed in winter clothes looking down on a scene from the summer! 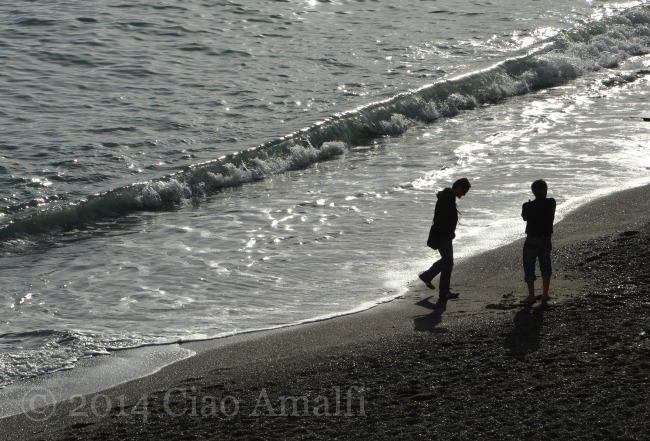 There were more people in Amalfi than in past weeks, perhaps couples taking advantage of the lovely weather for a romantic Valentine’s weekend trip to Amalfi. You’d have to know where to look, but the first signs of the coming busy season are starting to pop up here and there around town. 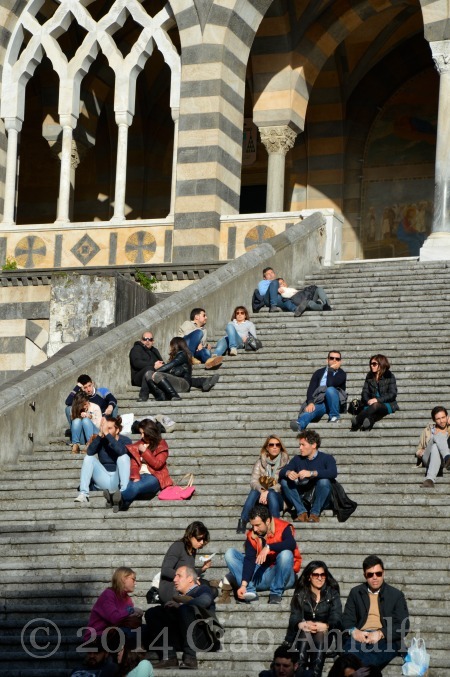 The sunshine on the steps of the Duomo had attracted a nice crowd of more urban sunbathers. It’s a good spot! We’re a little starved for sunshine here, but that’s mostly because we’re so spoiled the rest of the year. But once February arrives … spring is around the corner! Foto Friday: Buon San Valentino! Love is in the air … and not just for Valentine’s Day today. 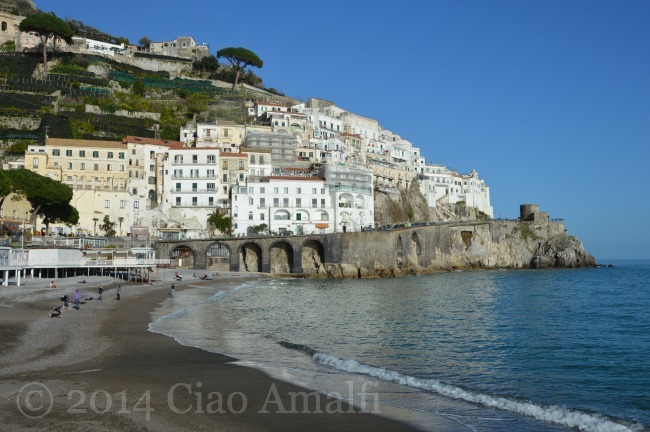 It’s sunny and beautiful on the Amalfi Coast! This morning I snapped this shot of the chocolate on display and the buildings of Amalfi reflected in the curved glass windows of the Pasticceria Andrea Pansa in Piazza Duomo. 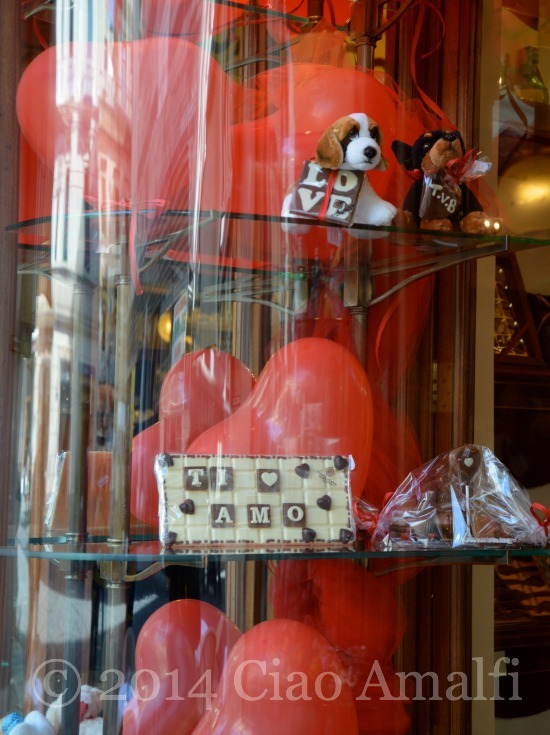 The white chocolate bar says, “Ti amo,” which means, “I love you.” How’s that for something sweet for your sweetheart? Wishing everyone a day full of love … Buon San Valentino! These are the days made for rain boots! 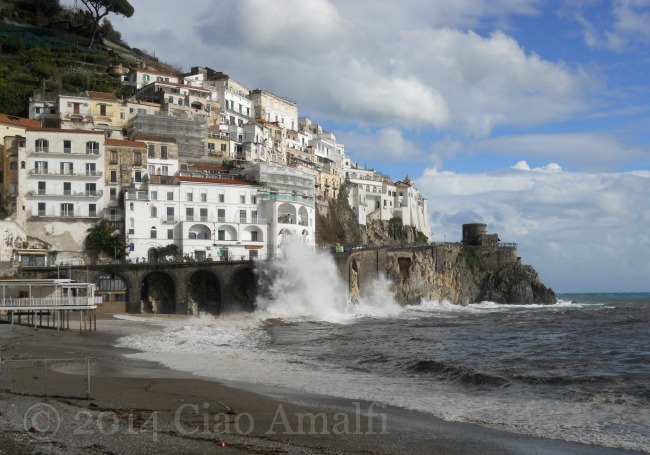 The sky was blue but the sea was angry, sending in big waves crashing against Amalfi. Always a striking view! 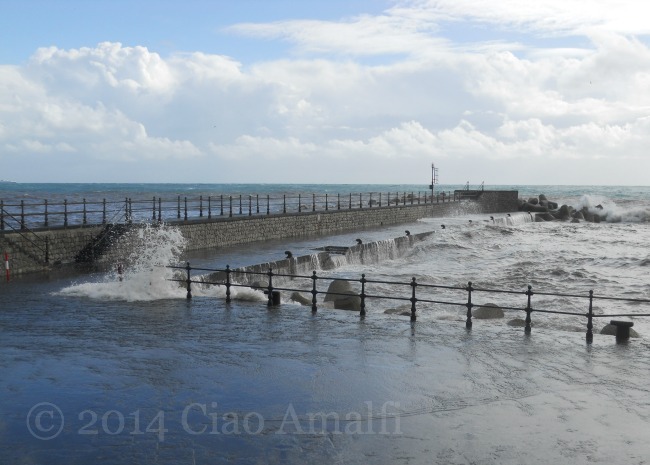 It was a strange mix to see blue skies and big waves together. Part of the parking area along the port was closed for, well, obvious reasons. You wouldn’t have wanted to park there yesterday! After lunch, while we walked along the port, the sea had already calmed down and the afternoon was clear and calm. What a difference a few hours can make!